Dental Crowns are a long lasting and effective way of covering and strengthening a heavily filled or fractured tooth. They are essentially porcelain caps that go over the tooth and protect it from further damage while at the same time, serving to improve its appearance. Both crowns and most bridges are fixed prosthetic devices that once placed by a dentist, remain in your mouth. Unlike removable devices such as dentures, which you can take out and clean daily, crowns and bridges are cemented onto existing teeth or implants and can only be removed by a dentist. A Dental Crown is used to entirely cover or “cap” a damaged tooth. Think of it something like a thimble on your finger. Besides offering a lot more strength to a damaged or broken tooth, a crown can also be used to improve a tooth’s appearance, shape or alignment. Crown’s can also be placed on top of a dental implant to provide a tooth-like shape and structure for functionality. Porcelain or ceramic Dental Crowns can be matched to the colour of your natural teeth. Other materials used in the manufacture of crowns include gold and metal alloys, acrylic and ceramic. The alloys are generally stronger than porcelain and may be recommended for back teeth. Porcelain in a colour to match your other natural teeth, bonded to a metal shell is often used because it is both strong and attractive. How exactly do bridges work? Your dentist may recommend a bridge if you are missing one or more teeth. Gaps left by missing teeth can cause the remaining teeth to rotate or move into the empty spaces, resulting in issues like a food packs and perhaps a bad bite. The possible imbalance caused by missing teeth can also lead to periodontal (gum) disease and temporomandibular joint (TMJD) disorders (jaw pain and functionality issues). Bridges span the space where teeth are missing. Bridges are cemented to your natural teeth or implants surrounding the empty space. Porcelain or ceramic bridges are matched to the colour of your natural teeth, or, if used for full mouth rehabilitation, a total colour transformation can be achieved for some patients. 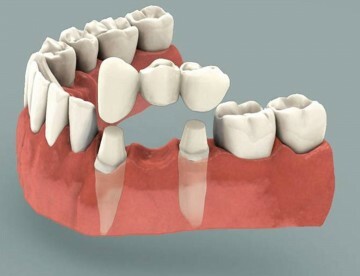 How are Dental Crowns and bridges constructed? Crowning a tooth is a simple procedure where the tooth is slightly reduced to make space for the surface area of the crown material. From the patient’s perspective, this procedure will not feel much different to having a regular filling done. An impression (mould) is taken, and the dentist carefully chooses a colour to match your existing teeth. The impression and all the information is then sent to a dental laboratory. For interim function and aesthetics, you will be fitted with a temporary crown or bridge. Within a week or two the crown will be ready and all that is left is for the temporary crown to be removed and the final porcelain restoration to be cemented on. This is usually a straightforward and painless procedure.